The sculpture by Sverre Wyller is situated in an open landscape in Østre Toten. Allium means onion and the sculpture’s form is inspired by the farming in this area. Allium is situated on a gravel road that leads up towards the Billerud Farm, with a view over Mjøsa. With one part on each side of the road, it acquires the role of a portal to the old estate, formerly a residence for high-ranking public officials with wall paintings by Peder Balke. The sculpture is 15 metres high and is made of reused steel. It is lacquered in a light blue colour that Wyller has used on several of his sculptures. The word allium (Latin) means onion and the sculpture’s form is inspired by the farming of Østre Toten. The sculpture is conceived as a line drawing of an onion and lies in the landscape like an onion on a tray in a classical still life. The portal is positioned on the diagonal across the gravel road, so that the sculpture’s largest volume is clearly visible from the county highway above. Locally the sculpture has been given the nickname Lauken (“The Onion”) and has assumed the role of an identity symbol in the surrounding community. Used materials are important for Wyller because the materials’ history gives the art work meaning. – The steel has been used, it has been degraded, now it has been revitalised and gains once more a significance and status. Steel that has been used before bears the mark of this. But the form is new – and thereby the meaning. Sverre Wyller is a Norwegian artist who works with painting and sculpture. He received his education at the Oslo School of Architecture and the Oslo National Academy of the Arts, at the Bergen Academy of Art and Design, and the Academy of Arts in Berlin. 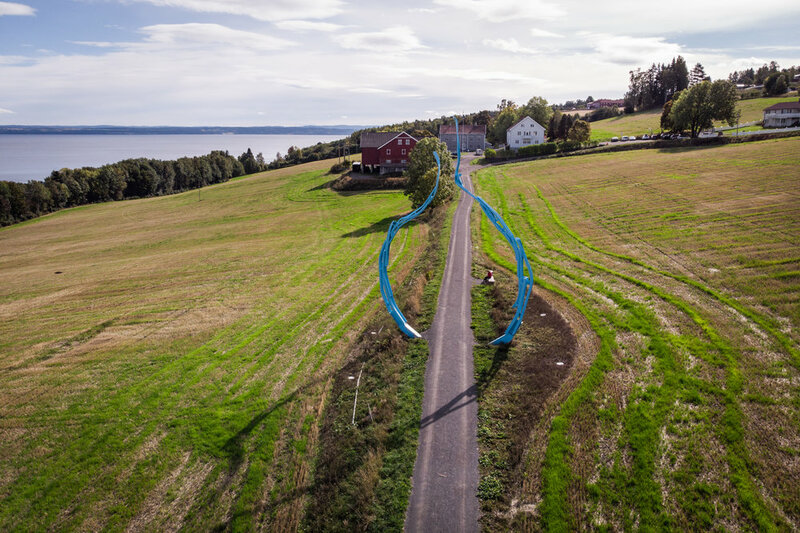 Wyller has created several public art works, including the sculpture Miramichi # 19 which stands outside The Vigeland Museum in Oslo. A typical feature of Wyller’s sculptures is the abstract and organic expression. With powerful, twisting and turning steel beams, the sculptures often recall living creatures. Østre Toten in Oppland County is one of Norway’s largest agricultural municipalities and is particularly well-known for the production of potatoes and onions. Industry also has a clear presence in the municipality. – I wanted a site that was in contact with Mjøsa and the surrounding landscape. It was also critical that there was a local source for the materials used in the project. Peder Balke-senteret gallery and culture center is situated close by the sculpture. Skulpturstopp is a gift from Sparebankstiftelsen DNB to Norwegian municipalities.